Hi everyone! I’m Luna, Creative Director at Altitude and the game designer for Run Run Super V. It’s been six months since our last Developer Diary, and many things have happened since then! This post talks about our alpha build that we released to the Google Play Store last August, what we learned from our players in the Philippines, and our plans for the game moving forward. Run Run Super V hit alpha last August 20. We had a minimum viable product: one playable character, one run area, 10 progression levels, and 3 boss fights. Usually, game studios release their alpha version to a small group of testers for feedback. Instead, we decided to release it into the wild: we published it as a free download on the Philippines Google Play Store. Releasing to the market this early was a risky move. We knew the content was incomplete and bugs were sure to pop up everywhere. But we did it to get real feedback on how players played our game. Since our alpha went live, we’ve had 12,200 downloads and 400 reviews. There’s no way we could have gathered that much data with a test group! We used analytics, a feedback form, and Play Store reviews to gather and analyze data. The early results left us stumped. Most players were not making it past level 2 or 3. People were dying at the simplest enemies. The goals we thought were easy to complete (such as “Jump on 10 enemies in one run”) were churning points! Could this be true? But the numbers didn’t lie. Our game was too difficult. And even with high reviews on the Play Store (indicating a great first impression), players simply couldn’t progress past their first session. How do we fix such a large problem? The trouble with metrics is that it shows you the symptoms, but you can only guess at the root cause. We decided the best way to approach it was through trial and error. Slowly, we rolled out updates, tweaking one thing at a time and looking at the results. 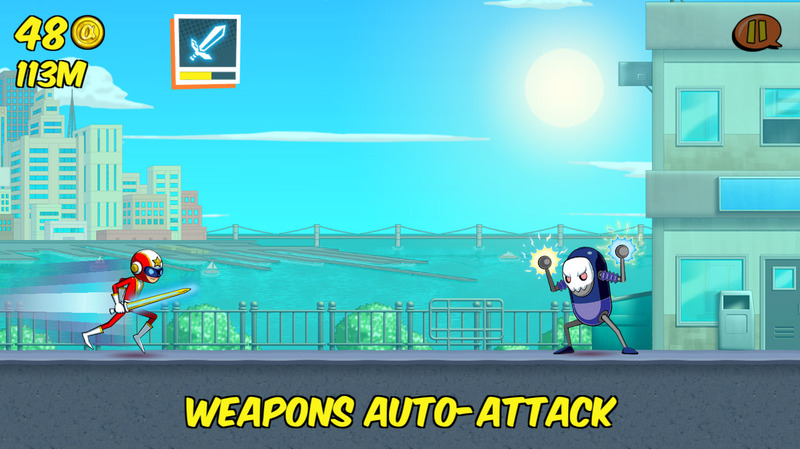 Our biggest change was our control scheme: we switched from split-screen controls (“tap left to jump, tap right to attack”) to a simpler “tap anywhere to jump, weapons auto-attack” system. We made the run goals easier. We made the boss fights easier. We watched each week as people slowly leveled up, adjusting whenever we saw another bottleneck. Level Progression metrics (all time). The first boss battle happens at Level 3. Day 1 Retention metrics (last update). Facebook seemed to help! After three months of metrics-gathering and testing, we’ve learned enough to pull the alpha from the Philippine Google Play Store. The 12,000-strong downloads have told us that there is a game worth making; the high reviews showed that the initial reception was good. We’ve tweaked enough of the gameplay to hit our stride here in the Philippines. It’s time to go abroad! We’re now preparing Run Run Super V to make the rounds through other Southeast Asian countries. This time, besides gathering gameplay metrics, our main goal is to hit our retention metrics. The dream is for 40% of players to return the next day (Day 1 Retention), and 20% to return after a week (Day 7 Retention). We’ve added more content and are currently working on new retention mechanics, and we’ll keep tweaking as much as necessary until we hit our goal. Thank you to all our players in the Philippines; your feedback has helped us improve the game by leaps and bounds. Stay tuned to this blog and our Facebook page to find out which country we’re going to next!